Celebrate the Republicans' joy in the Democratic Party's decision to fall behind some of their most controversial party leaders. 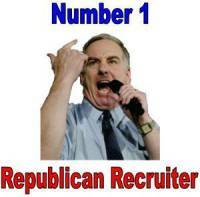 I just couldn't stop laughing when they picked Howard Dean to head the DNC. Now it looks like they might actually hitch their wagon of presidential hopes to Hillary Clinton. Even if you aren't a big political junkie, you have got to appreciate the endless opportunities for entertainment these bright moves will provide. "Into Obscurity and Beyond!" Take this question to heart. 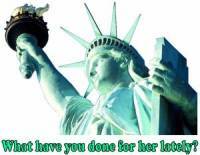 Public support of our nation, our military and our president is extremely important. Displaying flags and ribbons on your house and car are great, but consider if you might be able to do more. Stay informed, get involved, talk to neighbors and co-workers, volunteer in your community, smile at the people you meet. Spread your love of country and celebrate our incredible freedoms. 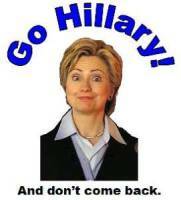 Go Hillary! Really, just go. If you are just simply tired of Hillary Clinton then this is the one for you. Get yours in advance of her election bids in 2006 and 2008. Buy in bulk for savings and pass them out to friends. Show your sentiments on a t-shirt, coffee mug, sticker, magnet, pin, cap, tile coaster, beer stein, baby clothes, bib, sweat shirt, running suit, dog shirt, apron or an assortment of other novelty items available. Kofi Annan - What Me Worry? Have a laugh at the expense of yet another self-serving anti-American. Do you think Kofi Annan should resign? Do you think he actually will? I doubt it. Many have learned from the wonderful example set by former president Clinton and will lie and deny without regard for individual honor and integrity. What a legacy from the only U.S. president ever impeached! Remember the Democratic Party's decision to elect the spectacular failure of Howard Dean to head the DNC. Share the humor with friends and strangers alike. Even if you aren't a big political junkie, you have got to appreciate the endless opportunities for entertainment these "progressive" moves continue to bring us all. Its time to start working to change the current two-term limit for U.S. presidents so we can re-elect George W. Bush for another four years. At this critical time in our nation's history we cannot take a chance on electing a weaker or less-devoted person to lead us. We the people can push to repeal the restrictions of the 22nd amendment. Go Hillary! And don't come back. We suffer a couple of past presidents that work harder now to create a post-presidential legacy than they ever worked while in office. President George W. Bush has already made a difinitve mark on the history of our great nation. Burdened with events and decisions unlike any faced by previous U.S. presidents, his perseverance and dedication to always do what is best for our country has been a Godsend for the United States as well as the rest of the world. 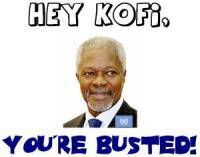 Kofi Annan - Hey Kofi, You're Busted! 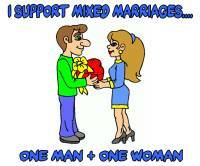 Display your beliefs in the time-honored tradition of marriage. Yep, politics is getting into that also. Check it out today! 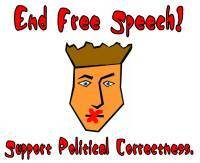 Everyone should know that the entire political correctness agenda is nothing more than a scam to curb individual rights to free speech. 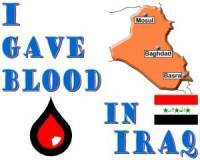 Show your awareness, and awaken your less-informed friends by displaying this slogan. Thats right. Too many folks are moving out of poverty and into the middle class. Have you seen recent home ownership statistics? More people own their own homes now and the largest percentage of minorities ever are participating in this portion of the American dream. The hollywood mouths and liberal elitists are calling for a change. They wish to raise taxes and quell independence. Its just so much harder to manipulate people who take charge of their own lives. Check it out today! 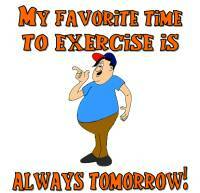 My Favorite Time to Exercise is Always Tomorrow! I admit that this statement is completely true for me. I am able to find an endless stream of excuses to put off things I'd rather not do. From the looks of many waistlines, I sure ain't alone. Might as well stretch on of these t-shirts around your gut and have a laugh along the way. My mind was floating over a beautiful carribean beach when I thought up this design. Ahhhh! To be lying on that warm, tropical sand with a cool drink right now! 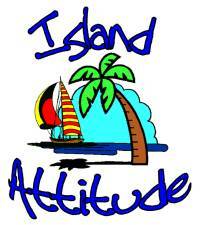 Oh well, you can join me in spirit anyway as you assume your own relaxed "Island Attitude". Unfortunately popular culture deems academic excellence and professional competence as a negative thing. Pride in yourself, utilizing your abilities and achieving your goals really are not bad at all. We must cooperate to change this attitude which holds back too many of our greatest people. Don't fear success! 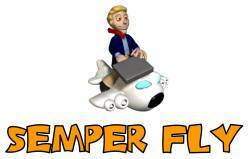 The Semper Fly graphic is great for anyone involved in the aviation field or travel industry. This especially shows our resolve after the devastation of September 11, 2001. Pilots, flight crews, flight attendants, gate agents, aircraft mechanics, airline support staff, air marshals, baggage handlers, airport and aviation security, and anyone else connected with or motivated by flying. 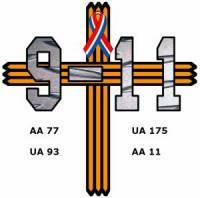 Show everyone that you have not chosen to forget the hateful events forced upon our nation on September 11, 2001. Maybe you can even help a few of your fellow citizens to have some recollection and possibly another brief resurgance of patriotism and national concern. This is why we must continue the fight against international terrorism. God Bless America and Keep Her Strong! Perfect for the tens of thousands of veterans returning from honorable service in Iraq as well as their families, friends and supporters. Show your support for our troops and our country's efforts in the war against terrorism. Perfect for the tens of thousands of veterans returning from honorable service in Afghanistan as well as their families, friends and supporters. 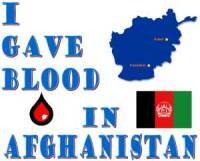 Show your support for our troops and our country's efforts in the war against terrorism. 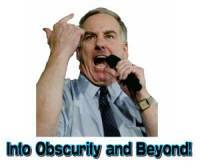 Howard Dean - Into Obscurity and Beyond! You've gotta call 'em like you see 'em and we have years of proof to support our call for a name change at the UN. 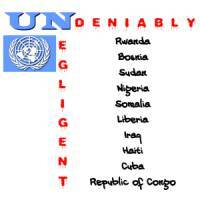 The United Nations has repeatedly been Undeniably Negligent. This collection of nations, run by many third-rate leeches, easily overlook their alleged responsibility to respond and assist people in need around the globe. Guess that can happen when you are more focused on anti-American and anti-Israeli goals. 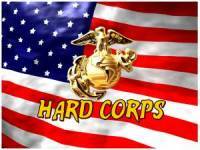 Ooh Rah! 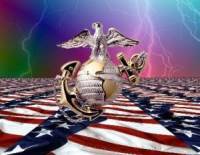 Devil Dogs and Marine lovers gotta celebrate their Corps by showing their pride to everyone. Get this inspirational USMC graphic on a t-shirt, coffee mug, sticker, magnet, pin, cap, tile coaster, beer stein, baby clothes, bib, sweat shirt, running suit, dog shirt, apron or an assortment of other novelty items available. 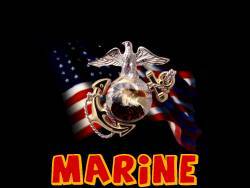 Jarheads, Devil Dogs and their admirers can show their Marine Corps Pride with this new graphic available on a variety of products. This one is perfectly displayed on our new BLACK T-SHIRT. Check it out today! Thats right, don't leave your rear exposed by to the evils we know are out there. There are some folks who can't quite figure this out, but there are many others who actually choose to ignore the truth. Wear it, live it, share it. The Semper Fly graphic is great for anyone involved in the aviation field or travel industry. Pilots, flight crews, flight attendants, gate agents, aircraft mechanics, airline support staff, air marshals, baggage handlers, airport and aviation security, and anyone else connected with or motivated by flying. Show everyone that you remember the terrorist attacks of September 11th, 2001; the tragic loss of our WTC Twin Towers, the four hijacked airliners, and the loss of thousands of citizens and immigrants who were enjoying the many freedoms provided by the American dream. Slap the blinders off the faces of those around you who have chosen to forget, brush off and belittle the horror we witnessed that day. Perfect for the frequent business traveler as well as anyone working in the aviation field or travel industry. Establish yourself as a Road Warrior with a choice of one or more of the following items: t-shirt, coffee mug, sticker, magnet, pin, cap, tile coaster, beer stein, baby clothes, bib, sweat shirt, running suit, dog shirt, apron or an assortment of other novelty items available. Just the thing for the too-frequent flyer or person on near-endless business travel. Also a smart gift for the pilot, flight attendant or air marshal in your life, as well as anyone working in the aviation field or travel industry. Buy in bulk for a greater discount and share them with your co-workers. 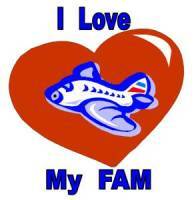 Especially for those lucky enough to have one of our valiant Federal Air Marshals as a family member, close friend, spouse or boyfriend/girlfriend. 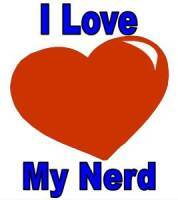 Got a special geek in your life? Then this is for you. Once ridiculed as social outcasts they are now revered for their sought after technical skills. Celebrate their revival. 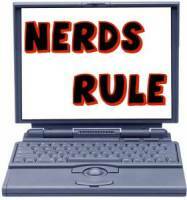 Que Vivan Los Nerds! Got a special geek in your life? Here is the perfect gift for him or her. Once ridiculed as social outcasts they are now revered for their sought after technical skills. Celebrate their revival. Que Vivan Los Nerds! Carrying around a little extra weight? Most guys develop a little extra around the middle as they age, so why let it bother you? The truth is that if it doesn't bother you then it doesn't matter to anyone. Display your confidence and self-respect with a variety of gear displaying this sentiment. Like your beer? Nothing wrong with that. Now you can let everyone else know that you have found true love in a convenient serving size. 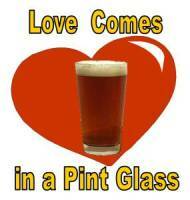 Mmmmmm, think I'll go grab a cold one right now! Sure, life is bitter, but you can make that positive by celebrating with a delicious English Bitter Beer. Its always better when taken with a friend or two. The Ballistic Diplomacy graphc design recognizes that there are some people and certain situations in which force is the only possible manner of negotiation. When talking doesn't work and a pile of written reprimands or useless resolutions are ignored, then it is time to step up the process and bring in an interpreter of cold, blued steel to lead the conversation. Bertie High School, Windsor, North Carolina. 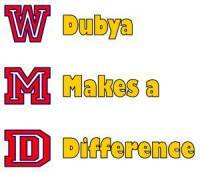 Its about time for the Class of 1986 to come together for their 20-year reunion. The Falcons Return to the Nest. NEW! Customized products for your own business, event, child, club, memory, etc. Simply select your favorite photograph, slogan or statement, child's drawing or graphic design then send it to me along with instructions as to which of the items above you would like to see them on. I will setup samples for you to view at NO COST then you decide which items you would like to purchase. These make great gifts or memorabilia for reunions, clubs, church groups, parties and friends and family. Direct Links to Every Available Category! Return to the URonDisplay.com Homepage.